Q: Do we need to have a second videographer? A: Having a second cameraman allows us to film more creatively than we are able to when filming with a single cameraman. We are unable to cover groom preparations when we do not have the second cameraman present which is a real shame because a lot of the story of the day is missed. Having the second cameraman lets us move quickly between location so that nothing is missed. In my personal opinion the second camera man has the potential of doubling the over all quality of the film by giving us more material to work with in the editing phase. Having the second cameraman also will increase the film length by as much as an extra 5 mins. But in saying all this if it just isn’t in your budget, I am quiet able to capture a very beautiful memory when filming on my own. A: to secure a booking with us we require you to pay a one third deposit. After this we will turn away all other enquiries for this date. Q: Will you be the primary cameraman filming our wedding or will you send someone else to film? A: I film all our weddings myself and will be in attendance at all weddings we cover, with the exception of severe illness. Q: What happens if you are severely ill on our wedding day? A: I have a stable of highly competent cinematographers I can call on to help cover for me in this event. To date I have never been ill enough not to attend a wedding. This is also another advantage of booking the second cameraman. Q: We are having a very intimate wedding with our closest family and friends, we think about 15 to 20 guests. Are you able to cover our day in a way that will be non intrusive to our guests? A: We try and be as non-intrusive as possible with all the weddings we film whether large or small. Obviously capturing key moments sometimes requires us to be in certain positions to ensure the best possible shot. But for the times we are asked to be extra stealthy we have techniques we can employ to enable us to be out of the way and capture the event from a distance using longer lenses or smaller cameras. Q: We are having a professional photographer at our wedding also. I was wondering how this will work also having a wedding cinematographer there? A: Each wedding video we film we are filming along side professional wedding photographers. This is usually fine and works without any problems. We try and be courteous to the photographer and we hope the photographer can also do the same for us. At the end of the day we both have the same client (you) and we need to work together to ensure the best outcome for both photography and videography. Problems can sometimes arise with amateur photographers or over zealous family members with cameras who aren’t mindful of us. Q: What do you consider to be an amateur photographer? A: Because we have the privilege of filming alongside some of Brisbane’s best photographers we have a pretty good sense of who is a professional and who is not. Amateurs tend to use a flash all day where professional photographers will use available light and only start using a flash at the reception in the evening. Professionals also use a higher grade of equipment which allows for better low light photography. Amateurs usually also take photos with very wide lenses and as a result will usually be standing to close to you all day and feature prominently in your video also. Professionals will use a mix of both long and wide lenses and rarely interfere with our efforts. Q: What happens if it rains all day on the day of our wedding? A: We have been filming weddings for a long time now an as a result have also filmed on many rainy days. It’s a good idea to have a wet weather plan thought out in advance incase of this situation. We know of many great spots that can be used for the photo shoot which offer protection from the rain. Plan ahead and pack some matching umbrellas for the bridal party is also a good idea if the forecast doesn’t look good in the days leading up to the wedding. Most importantly don’t let the bad weather spoil your day! ‘When life gives you lemons make lemonade’. In my experience the rainy day weddings take on a charm of their own and your film will be unique with a romantic European feel. Look at this film as an example. Q: Are we able to choice our own music? A: Because we are creating a very personal and intimate film for you both I encourage you to supply me with your music choices. I usually require a selection of 5 songs. We have a selection of royalty free music that you can choose from or alternately you can obtain the rights to uses songs that have special meaning to you. We are able to assist you with this. Q: When you talk about Photo shoot in your package description, what do you mean exactly? A: When I talk about photo shoot in our package descriptions I’m meaning that we follow you both out with your photographer after the ceremony and film some beautiful shots of you both together as a newly wed couple. This photo shoot is generally done in the afternoon between the ceremony and the reception. The lighting conditions are best for photos in the last two hours before sunset. If you aren’t having a official photographer and just choosing to have a video done, we will take you both out to a nice location and get these beautiful shots on our own. Q: What is an unplugged wedding, and why they are a good thing? A: An unplugged wedding is where you ask your guest to leave their cameras at home and come and enjoy the day and witness the wedding through their own eyes rather than an LCD screen. More and more often we are struggling with guest blocking key moments with their ipads or pocket cameras to a point that it affects the quality of the film. By asking guest to not take photos it also has the added benefit of not having unflattering photos getting onto social media before your official beautiful photos are ready. Q: How long will our film take to be finished? A: Because our films are in high demand and the fact that we spend close to 2 weeks on each wedding film we edit, delivery times can vary depending on the season. In busy times of the year we can film as many as five wedding videos in a one month period which creates 2.5 months of work and creates a back log of editing. As a general rule I say delivery will be between 2 to 5 months after the wedding day. If you are getting married off peak it will be sooner than getting married in peak season. The best way to think of this wait is to think of it like a bottle of wine, the longer you wait the better the experience will be when you do receive your treasured memory. We try to deliver the wedding videos in order of when they were filmed. In special circumstances we can sometimes bump one ahead and do an express edit for an additional fee. Q: Why do prices between different wedding videography company’s differ so much? A: With wedding videography it is very much a case of you get what you pay for. We pour many hours of time into our films, sometimes spending as much as two weeks in the editing phase for our higher-end films. We are constantly upgrading our equipment so that we can offer the highest level in picture quality and creative shooting techniques. We take about $30K worth of equipment to each wedding we cover because we film on as many as 4 highend camera for a truly cinematic film. Many smaller companies have popped up recently producing cheaper quality work using older antiquated equipment only out to make a quick buck. With little to no experience and missing key moments or getting shaky or poorly composed shots. Choosing Storyteller Films is very much an investment in quality and piece of mind, knowing that nothing is being left to chance. Q: How will our finished film be presented? 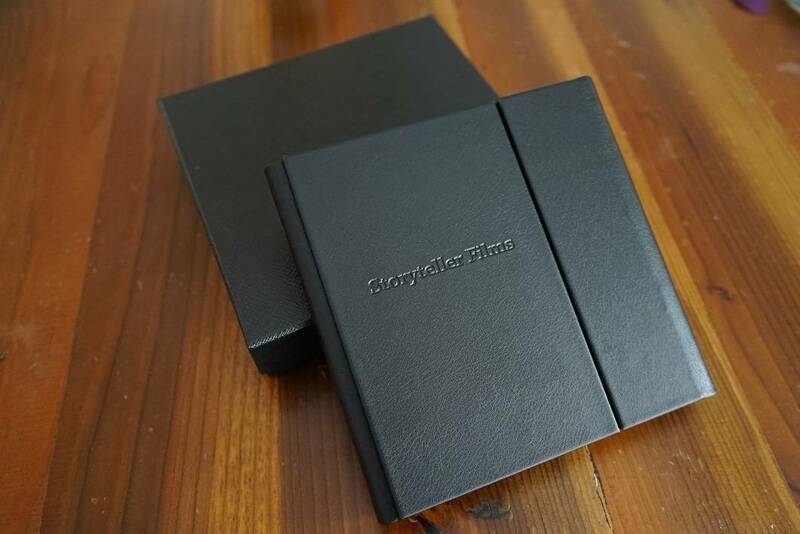 A: Depending on the package chosen, our films are usually presented in a beautifully crafted embossed folio cover. This will contain both a USB version and a Bluray disk both in Full HD. Q: How much time should we allow for preparations in the morning? To create a film of this caliber it is very important to have a well planned and timed day. In this example the couples were all getting ready within 2 minutes of the ceremony location. The reception was also at the ceremony location. A vast amount of time can be gained by having everything so close together. This time can then be utilised to help craft an extraordinary film. When a couple get ready 30-40 mins away from the ceremony location a lot of time that could be better spent collecting beautiful shots is wasted in transit. For a wedding I recently filmed a total of 3 hours was wasted driving between locations. This used up valuable time from their package time allotment and left us with insufficient footage to craft a film to the very high level that we strife for. But getting back to the original question after considering the above. The most important timing for the day is being at the ceremony before the bride with enough time to cover her arrival and get the shots of guest arriving. Setup time at this point is also critical with multiple cameras and sound sources to prepare. For this reason I like to be at the ceremony location 1 hour before the bride. Travel time will then need to be added to this to calculate the departure time. This is where we calculate the second most important timing for the day, when the Bride should be in her dress. I like the bride to be in her dress no later than 15mins before I need to leave to set up for the ceremony. Because we like to do interviewing in the morning to enhance the emotional content of our films, additional time is required for this too. I usually like to arrive at the bride’s preparations 2 hours before the time that I will need to leave by (calculated by working back from the ceremony time & travel time). If Groom preparation are also going to be captured there are Three options. If a single cameraman is capturing the day he will need to arrive earlier in the morning and film the Groom and Groomsmen getting ready just for the cameras. This is usually way too early so once the cameraman leaves for the bride’s location the groom and groomsmen can undress and relax in their shorts until closer to the wedding time. The second option is to have the Bride and Groom getting ready very close, for example two apartments in the same complex. A single videographer should be able to quickly move between both locations and cover both preps. In this example the groom will still need to get ready a little sooner than the bride and rather than arriving 2 hours before, 3 hour would be required. The third option is to have two videographers cover your day. In this example the preparations could happen simultaneously and we could properly capture both. This option I find works the best for a very high quality film. Couldn’t find the answer to your question? Please send me an email and I’ll get back to you ASAP.